The Refined Geek » X-37B, A Shuttle It Ain’t. 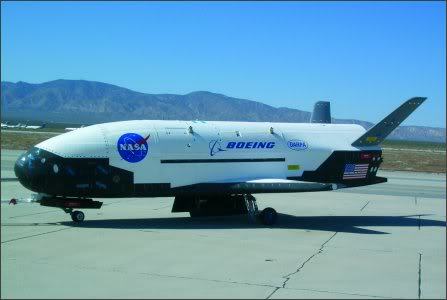 X-37B, A Shuttle It Ain’t. That my friends is the X-37B, an orbital test prototype of the X-37 series of spacecraft. Don’t let the NASA badging on that plane fool you though as whilst the project was initially started in the hands of NASA it is now completely in the hands of the Department of Defense with NASA only having a small informal involvement in the project. Last week saw this craft successfully make its maiden flight into orbit but not to the usual fanfare that a new craft attracts and for good reason, everything about it is super secret. About 10 years ago NASA began the X-37 project and invested quite a bit of cash into the development of the vehicle. Even back then the purpose of the craft was somewhat of a mystery as the primary function of this craft would be the launch and retrieval of payloads into space. Realistically this capability was already covered off by the space Shuttle (and indeed this craft was going to be launched in the Shuttle’s payload bay until they figured out that would be a waste of money) and even that had been usurped by the fact that it’s cheaper to deorbit and launch a new satellite than it is to bring an old one down for repairs and send it back up again. In 2004 the X-37 project was transferred to DARPA and the project became classified. Usually that would mean the project would forever be surrounded in the mystery that accompanied its birth but the acquisition by the Department of Defense clarified its purpose. The Shuttle owes its current massive girth and plane like design due to the military’s involvement. Back then satellites were still expensive and the idea was that the Shuttle should be able to capture and retrieve broken military satellites (hence the large payload bay). Additionally there were some mission profiles which required the shuttle to launch into polar orbits, complete one orbit and then return to where it had launched from. Because of this the Shuttle had to have very large wings in order to be able to glide back to its original position, as the earth would have moved about 2000KM in the time it took them to complete such a maneuver. Looking at this diminutive cousin of the Shuttle you can see such the characteristics of such missions profiles are very prevalent, such as the large wings and payload bay. The differences begin when you look under the hood and find that it’s fully robotic, capable of completing almost every task without human intervention. Additionally it carries with it a large solar array which allows it to stay in orbit for 270 days which is an eternity when compared to the Shuttle’s measly 2 weeks. Additionally unlike the Shuttle which is in essence its own rocket (those 2 SRBs strapped to the side of it are just to get it started, most of the work is done by the main 3 engine cluster on the back) the X-37 craft launches atop an ATLAS V rocket. The engine you see on the back is used for maneuvering on orbit and nothing else. Overall its a pretty nifty little ship and really it should’ve been designed at the same time as the Shuttle. This craft serves the purpose of being a reusable transport to space that’s design to deliver and retrieve cargo and the lack of a crew makes it that much more efficient at doing its job. Had such a craft been designed around then you can bet that the Shuttle would look nothing like it does today and, more importantly, it wouldn’t be the huge cash drain that it has been for NASA over the past decade. Still there’s not much reason to dwell on that fact since it will soon be replaced by those upstarts in the private space sector which, in my opinion, can’t come any sooner. Hopefully since the military now has its own craft for performing its super secret missions they’ll keep their noses out of NASA’s business and we’ll avoid the whole design by committee debacle that was the Shuttle’s design process with future craft. Cool Post. I’m somewhat surprised to learn the shuttle has such a role in its flight given that i’ve only ever seen it launch by piggybacking on some rockets. Could it theoretically launch itself then (Or with small modifications)? Also to answer a long standing question from West Wing: Was there a military-only shuttle sitting in hanger somewhere over the last 30 years? In theory yes it could however it would need a lot more fuel to do so, somewhere in the order of around 80% more. The SRBs are extremely powerful engines and are responsible for the hard work of pushing the Shuttle through the atmosphere. The SSMEs operate far more efficiently the closer you get to a vacuum so it makes sense to use the SRBs to get them up and off the ground and the SSMEs for the rest of the journey. Long story short though you’d need some heavy modifications to get it done. There was plans to build a military space shuttle but it never got off the ground. Save for a super secret project that no one outside the team knows about the closest thing to an actual shuttle like that would’ve been the Russian Buran which bears a striking resemblance to the American Shuttle. Up until 2002 it was housed in a hangar outside Kazakhstan after which it was unfortunately destroyed due to the hangar collapsing. If there was a real world analogue for the West Wing plot, it was the Buran. I’ve been loving your blog these last few days dave… you need to think about monetizing your traffic – hit me up, we’ll talk. Keep up this amount of posting and you’ll be ripping it in no short order.